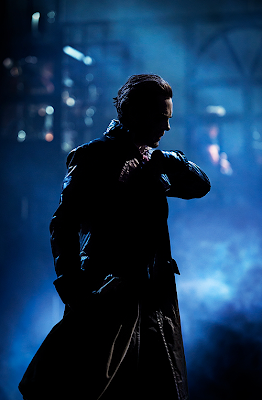 Me, the city of Stockholm, and the musical Sweeney Todd have a history together. I last visited the Swedish capital six years ago: me and my long-suffering dad travelled to Stockholm on the movie's opening weekend. I saw the film three times then. So, it's fun that my newest trip to Stockholm also included watching Sweeney. Though, this time, I saw it live in Stockholms Stadsteater! I've mentioned it before that Sweeney is so dramatic it's silly. It's a weird mix of true sorrow and black humor, and you can't always tell what is supposed to be what. On one hand, you have serious songs about sincere feelings (my favourite is Sweeney's part in Johanna Quartet. It's such a beautiful song about longing for what cannot be), but on the other hand – a murderous barber and cannibalistic pies. Yeah. If you stop to think about it, it doesn't really get sillier than that. I admit I sometimes laughed at the wrong parts. 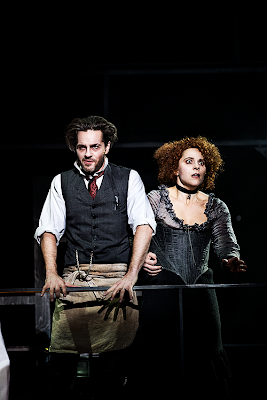 You rarely see anything as angry onstage as Peter Jöback's Sweeney. I'm afraid his Epiphany was a touch too wild for me to keep a straight face throughout – it'd been best experienced from a bit further than the third row, maybe... Jöback was quite over-the-top all the way through, and his voice didn't suit the part. 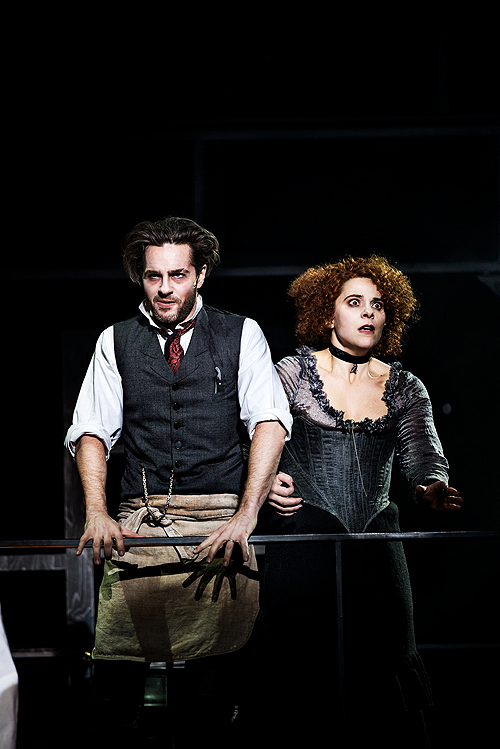 Vanna Rosenberg as Mrs. Lovett, then, didn't really leave a lasting impression on me. I think I liked Maja Rung as Johanna the best. Her Johanna was half-crazed by her loneliness from the beginning, you could see the fear in her eyes all the time. I don't know if I could call this production good, per se. For the first 30 minutes, I didn't like what I saw and was sure I'd walk out disappointed. But somehow, the show grew on me. I suppose I got into the right mindset after the first few scenes. By the very end, I couldn't stop smiling. The over-the-top energy was exactly what made me enjoy the piece. Had they tried to do this more seriously, the show might've fallen flat on its face. But throw a couple of limbs into the meat grinder during the serious song and there you go! This show made me feel happy, plain and simple. It was probably the nostalgia, the 14-year-old inside me who had been wanting to see this exact production ever since she fell in love with the movie... I can't rationally explain why I had such a good time, and if someone reading this text decides to see the show, I certainly can't quarantee they'll enjoy it. But for me, it worked. It was fun. A perfect return to Stockholm for me.